Oxfordshire County Council Fire and Rescue Service are fully committed to supporting local and national business located within Oxfordshire to ensure that we have a world class business environment for the benefit of all the members of our community. To this end we are committed to enforcing the fire safety legislation that we are responsible for in a fair, transparent and proportional manner. Wherever possible we aim to provide assistance and guidance to achieve compliance with the legislation and only resort to formal action or prosecution in the most serious cases or where repeated failures have occurred. The responsibility for ensuring compliance with legislation generally lies with the responsible person, usually the employer or in some case the owner. The responsible person is required to carry out a fire risk assessment to comply with the Regulatory Reform (Fire Safety) Order 2005. Oxfordshire County Council Fire and Rescue Service fulfil this statutory duty by inserting notices issued under the Regulatory Reform (Fire Safety) Order 2005 into Chief Fire Officers Association (CFOA) enforcement register. 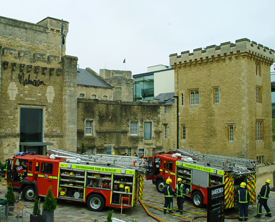 Established in 1995, the Commercial Fire Training Unit exists within Oxfordshire Fire and Rescue Service and has a direct link to Oxfordshire County Council. The Unit delivers a variety of Fire Safety training in Oxfordshire to a wide range of businesses and institutions within Oxfordshire. All our courses can be tailored to your needs and delivered at your premises (subject to required terms and conditions). We also offer scheduled an 'open' Fire Marshal course at a variety of venues located around Oxfordshire. From 6 April 2014 fire and rescue services in England and Wales will be able to enter into partnerships with businesses, charities or other organisations which operate across more than one local authority fire enforcement area. Partner fire and rescue services become the single point of contact for fire safety regulation advice. If a fire and rescue service believes that there is a statutory requirement for taking enforcement action it will notify the Primary Authority of the action it proposes to take unless the action is of an urgent nature to ensure the safety of employees or members of the public. If there is disagreement over whether proposed enforcement action is consistent with the advice given by the Primary Authority the Better Regulation Delivery Office is empowered to determine what, if any, action should be taken. The Primary Authority scheme is open to any business, charity or other organisation that is regulated by two or more fire and rescue services under the Regulatory Reform (Fire Safety) Order, 2005. The Primary Authority Scheme is a partnership arrangement so you should take time to ensure that the fire and rescue service that you choose to partner with is right for your business and can offer what you are hoping to get out of the scheme.